The auction of Habanos humidors has become one of the highlights of the Festival del Habano, a global event that year after year captures the imagination of the whole cigar world. By the very nature of each of the Habanos contained in these majestic and elegant humidors, every lot in this auction is the ultimate expression of luxury, art and skilled handicraft. They represent the best known and biggest selling brands distributed by Habanos SA., in some of the most emblematical Habanos cigar sizes, which are the most sought-after by the fervent admirers and passionate consumers of the best cigars in the world. All Habanos contained in these humidors were produced by the best cigar rollers in Cuba using tobacco leaves from the finest plantations of Vuelta Abajo for the exclusive purpose of being part of this auction. Some lots are accompanied by works of art and luxury goods that have been donated voluntarily by Cuban artists and world renowned manufacturers. As every year, this auction is not about profit. All the revenue raised will be donated in full to the Cuban Health System. 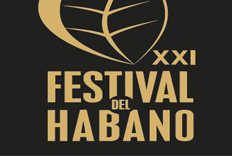 For this reason the Habanos Festival auctions are, and will always be, an expression of fraternity and appreciation from those who love the world’s best cigars to the people of Cuba. Habanos S.A. and the Ministry of Public Health of Cuba, on behalf of all Cubans, wish to express their gratitude for the goodwill and generosity shown by all participants. H. Upmann is one of the oldest brands of Habanos. Established in 1844, its range of sizes strikes an ideal balance between its strength of flavour,light to medium, and the unmistakable aroma and taste of its Habanos. All H. Upmann sizes are made entirely by hand with long filler leaves grown in selected fields in Vuelta Abajo, the best tobacco region in Cuba. This is a piece of furniture with simple lines but with elegant finishing touches that reflect the more classic style cigar humidors produced in Cuba. It was made entirely by hand from cedar and mahogany, Cuban woods which were duly selected and worked for the preparation of this humidor. 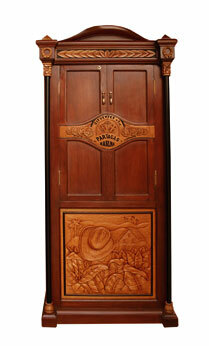 Front opening, the door bears a carved brand logo and the name that identifies it at the top of the interior. 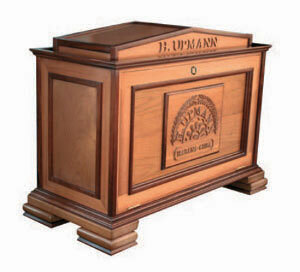 Inside, placed around the logo of H. UPMANN in high relief, the humidor has 12 horizontal trays made in Cuban cedar. The arrangement of the drawers and humidifiers provides for optimal and safe conservation of all the cigars. Dimensions: height 105cm, width 85cm, depth 58 cm. Interior capacity: more than 200 cigars. This humidor contains 225 Habanos H. Upmann brand: 25 Magnum 46, 25 Magnum 50, 25 Sir Winston, 25 Upmann No.2 and as special sizes that are not within the regular brand portfolio and which were created exclusively for tonight: 25 Upmann No.1 (42 ring gauge by 165mm long), 25 Noellas (42 ring gauge by 135mm long), 25 Robustos, 25 Magnum 48, and 25 Grandes (49 ring gauge by 168 mm long). This piece is made by the artisan Neury Ges Alberto Santana, a member of the Cuban Association of Artisans and Artists (ACAA). Self-taught, he has works in private collections in different countries such as Canada, USA, France, Mexico, Spain and Japan. 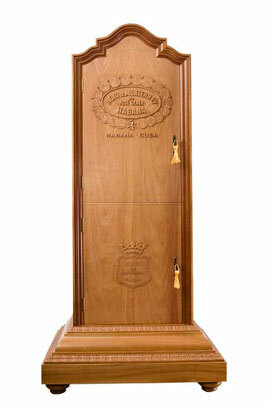 His humidors have been auctioned at the I, II, III, IV, V, VI, VIII, X Habanos Festivals. Hoyo de Monterrey is the brand of Habanos whose origin is directly linked to the plantation that it was named after. Located in San Juan y Martinez, in the heart of the Vuelta Abajo tobacco region in Pinar del Rio, this plantation still exists and grows first class Cuban tobacco. Records of the brand date back to 1865. The most knowledgeable aficionados of cigars from Hoyo de Monterrey appreciate their formats for the smooth taste of their blend and their characteristic aroma. It is the brand for the many smokers who prefer lighter tasting Habanos. All Hoyo de Monterrey cigar sizes are made entirely by hand with long filler leaf tobaccos from the Vuelta Abajo region. With a design inspired by the brand image, this humidor displays in pride of place the logo and the emblem of Hoyo de Monterrey. Both elements have been created using joinery and wood carving inlayed with precious Cuban hardwoods: mahogany and cedar from the mountains of Pinar del Rio. The upper part recreates the entrance to the Hoyo de Monterrey plantation. The humidor has two compartments: the upper part with 6 horizontal, cedar drawers in which to put different sizes of cigars and 3 drawers with humidifiers. At the bottom there are three levels of interchangeable and adjustable compartments or drawers in which to store and preserve Habanos and one drawer for the humidification of the cigars. The location of the humidifier guarantees a perfect conservation of all cigars. Dimensions: Height 175 cm, width 82 cm, depth 62 cm. The interior has capacity for 200 cigars and loose in drawers with 30 drawers. This work contains 200 Habanos from Hoyo de Monterrey: 25 Epicure Especial, 25 Epicure No.2, 25 Epicure No.1. In addition, special cigar sizes from outside the regular portfolio developed exclusively for this humidor: 25 Piramides, 25 Double Coronas, 25 Extravaganzas (50 ring gauge by184mm long), 25 Particulares (47 ring gauge by 235mm long) and 25 Gran Piramides (57 ring gauge by 160mm long). 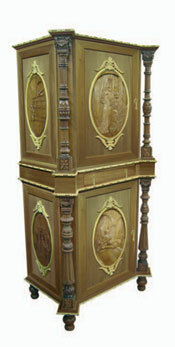 This work was developed by the “DECUBA – Art in Wood” group of craftsmen with artistic direction and execution provided by Jorge Luis Milan Domínguez and Leuvis Santos, and with the participation of Adalberto Gonzalez Albisa, all of whom are members of the Association of Craftsmen and Artists of Cuba (AACA). Pieces from this group of artisans have been exhibited and sold at auction at various national and international events as well as at the auctions of the Habano Festival. Their work is distinguished by the use of a technique specially developed by the group for wood carving and marquetry. The famous play “Romeo and Juliet” by the English playwright William Shakespeare, was also the inspiration for a Habano brand. Created in 1875, Romeo y Julieta has the privilege of having an undisputed reputation throughout the world of cigars. Romeo y Julieta is characterized by a wide range of cigar sizes in different shapes, so it has become perhaps the most prized brand for those who prefer the medium strength associated with the classic taste of the Habano. All the various sizes of the brand’s ample range are manufactured entirely by hand with leaves grown on the plantations of Vuelta Abajo, known worldwide as the best Cuban tobacco region. 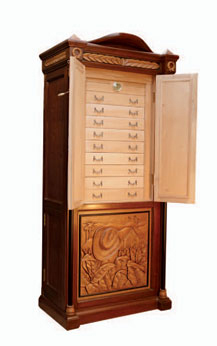 This humidor is made from, and decorated with, precious Cuban woods and combines the fine craftsmanship of cabinet making with woodcarving and marquetry in relief. To recreate the identity of the Habanos brand, the design has borrowed from the tradition of early nineteenth century Cuban furniture making to reflect the love and death literary theme of William Shakespeare’s tragedy. The side panels and doors have been carved in high relief, completely by hand, using Cuban hardwoods such as cedar, mahogany, jocuma and dagama. White glue, wood dyes and polyurethane finishes have been used to complete the piece. 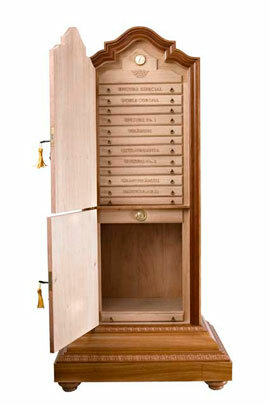 The cabinet is constructed in three parts: the upper and lower cabinets contain 5 drawers each for storing different sizes of cigars (25 in one compartment, and in his trunk), the central part, with 2 drawers for storage of the smoker and his humidifying time achieving the top of the cabinet. Dimensions: Height 1.97m, width 0.95m, depth 0.66m. The capacity inside the cabinet supports the conservation of more than 250 Habanos, plus a 2 drawers for humidifiers and 1 for smokers’ accessories. It contains 275 Romeo y Julieta Habanos: 25 Churchills, 25 Short Churchills, 25 Exhibicion No. 3, 25 Exhibicion No.4, 25 Exhibicion No.2, 50 Juliietas and 25 Wide Churchills (the latter two are new cigars to be released in 2010); in addition special cigar sizes, which are not within regular brand portfolio, developed exclusively for this humidor: 25 Romeos (52 ring gauge by 162mm long), 25 Hermoso No.2 (48 ring gauge by 157mm long), 25 Fabulosos No.6 (52 ring gauge by 180mm long). It is the work of the “JGARRIDOC” group represented by Julio César Garrido Correa, artist and craftsman of the Cuban Fund for Cultural Property (FCBC), Filial Pinar del Rio. He has participated in several international exhibitions in countries like Spain, France and Belgium. Some of his works have been auctioned at previous Habanos Festivals; others are part of private collections in several countries around the world. In early 1900, Guccio Gucci opened a small craft shopin which the famous Italian brand Gucci was born. From 1950 onwards, it enjoyed rapid growth and become a brand known worldwide for the highest quality products (footwear, handbags and other women’s accessories), leading to the opening of boutiques in Italy and then, rapid expansion to other world markets. In the 1980s Giorgio Gucci reached its greatest popularity in this type of luxury products. In 2000, Giorgio Gucci decided to create a new project; to design and produce a new collection of handbags and accessories in natural leather, which would mark the birth of the Giorgio Gbrand. Soon this brand became a symbol of quality, and expanded its products by adding women’s fashion in clothing. 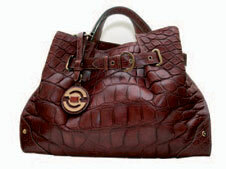 Gucci handbag natural leather of the American crocodile. Dimensions: 41 x 28 x 16 cm Mat finish. Italian design. Manufactured in Florence. Since 1845, the date when this Habanos brand was founded, Partagas cigars have been made at the world famous Partagas factory. After over a century and a half, Partagas remains the favorite brand for cigar smokers who enjoy more intense flavors. All the sizes found in this brand are totally hand made with long fi ller tobacco leaves from the fields of Vuelta Abajo in the westernmost part of the island of Cuba. 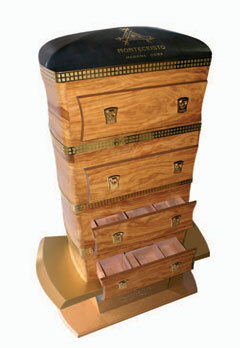 This majestic humidor is inspired by the Partagas brand. The most recognized and distinctive elements associated with the brand are refl ected in its design and construction such as its band and box label. By the use predominantly of the hand carving techniques, scenes from the cultivation of Cuban tobacco are highlighted including plantations, tobacco leaves and tobacco fl owers. It is made entirely by hand from Creole cedar. Other techniques of Cuban craftsmanship were also used in combination with the fi nest classical woodworking skills. Dimensions: height 140cm, width 65cm, depth 40 cm. This humidor contains 225 Habanos Partagas them: 25 Salomones, 25 Serie P No.2, 25 8-9-8, 25 Serie D No.4, 25 Lusitanias, and special cigars outside the regular brand portfolio : 25 Series D Especial Limited Edition 2010 (50 ring gauge by x 141mm long), 25 Serie P No. 1 (50 ring gauge by 127mm long), 25 Sobresalientes (53 ring gauge by 153mm long) and 25 Gran Piramides (54 ring gauge by 180mm long). 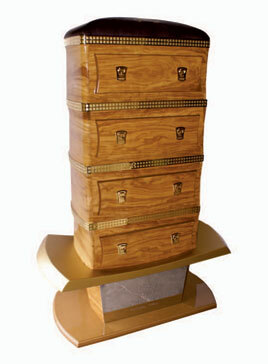 This humidor was designed and developed by artists Marlene Silvera Segura and Moisés González Acosta. Marlene Silvera Segura is a sculptor, who graduated from San Alejandro School of Art and Design Institute. Sh is a member of FCNC. Moisés González Acosta is a self-taught artist, but his work has been recognized and honored. The works of both artists decorate many smoking rooms, and Casas del Habano lounges and protocol rooms around the world. They have participated in auctions and other activities of great importance for Habanos S.A.
“Mas la Plana” is the most prestigious red wine fromTorres, and is recognized worldwide for its quality and limited production. The historic Mas La Plana vineyard,devoted exclusively to producing the wine that bears its name, is located at Pacs in Central Penedès. These privileged acres, formerly a stronghold of the Counts of Barcelona, are now fully acclimatised to red Cabernet Sauvignon grapes. 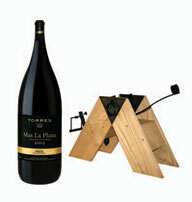 “Mas La Plana”, is also known as “Black Label” and “ The King of Cabernet Sauvignon. It is a wine whose the grapes are from a single vineyard with low yields. Production is meticulous and the wine is aged for about 18 months in new French oak. Mas La Plana has been tasted by many experts and critics in internationally renowned journals and has obtained extraordinarily high ratings. Amongst them are The Wine Spectator, Wine Magazine and Robert Parker’s Wine Advocate. It won the Gold Medal at the International Wine Challenge in 1995 and Mundus Vini in 1997. Montecristo is the best known brand of Habanos throughout the world. The origin of its name is part of the history and culture of the Cuban cigar: thanks to the readings in the factory from Alexandre Dumas’ book “The Count of Monte Cristo, the rollers came to appreciate the novel so much that it was decided to put the name of its hero on the cigars that they produced.Over time, the cigar brand has surpassed the fame of the novel itself. Since 1935, Montecristo has become a worldwide reference for cigar lovers. Its aromatic and delicious cigars are distinguished by their balanced medium to full strength and flavor capable captivating and delighting both expert smokers and those who enter the world of Habanos for the first time. Its excellent concept of design and visual impact allow this piece to strike the right balance between functionality and aesthetics. It consists of 4 modules of wood separated by gilded metal fillets. Within each there is a solid cedar tray separated into 3 sections. Each tray has 1 digital hygrometer and 2 humidifiers which ensure that the storage conditions and maintenance of all the Habanos inside it are optimal. It is a totally hand made humidor using the highest quality materials; a combination of olive root with cowhide and other natural leathers as well as rare woods combine to convey the whole spirit of the Montecristo brand. Dimensions: height 170cm, width 90 cm, depth 50 cm. This humidor contains 300 Montecristo cigars: 25 Montecristo A, 25 Petit Edmundo, 25 Montecristo No.2, 25 Eagle, 25 Master, 25 Regata, 25 Edmundo, 25 Montecristo No. 4, and the following special cigar sizes outside the regular brand portfolio developed exclusively for this humidor: 50 Gran Edmundo Limited Edition 2010 (52 ring gauge by x 150mm long), 25 Double Coronas (49 ring gauge by 194mm long) and 25 Maravillas No.1 (55 ring gauge by 182mm long). With over 25 years of experience, Grupo Humidif, whose brands include HUMIDIF, BUCARO and DK and LUXURY PACK, offers a wide variety of products and accessories. Under the HUMIDIF brand it markets an extensive range of products for the cigar world such as luxury humidors, travel humidors, leather cigar cases, humidification systems, ashtrays, lighters, and others. Cohiba first surprised the world of fine smoking in 1966. It is the most prestigious brand in the world of cigars. Its name became famous with extraordinary speed in essence because it encapsulates the origins of Cuba, its history and its culture. In the manufacturing of its famous cigars only tobacco leaves that are “the selection of the selection” from the 5 best vegas (tobacco fields) of San Juan Martinez and San Luis in the Vuelta Abajo region, are chosen for its exclusive use. Cohiba is the only brand of Habanos in which two of the three types of leaves (seco and ligero) used in the filler undergo a third fermentation in barrels. The whole manufacturing process for all Cohiba sizes is blessed by the care and dedication of the experienced rollers who make them. The result is expressed in an unmistakable taste and aroma; besides the beauty of the wrapper leaves that dress them. Cohiba is the Habano that everyone aspires to smoke. 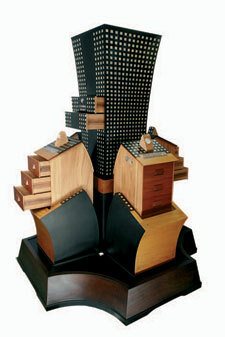 This majestic and futuristic work consists of a group of 5 tower-shaped humidors (4 around the outside and one in the center) built on a solid base of cedar and mahogany. 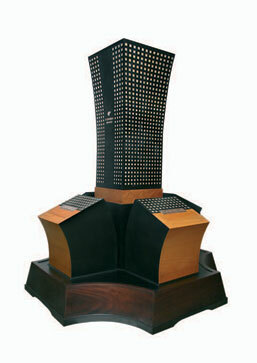 The outside towers represent the three lines of the Cohiba brand, and the fourth is devoted to the specialties that have been made for the brand. 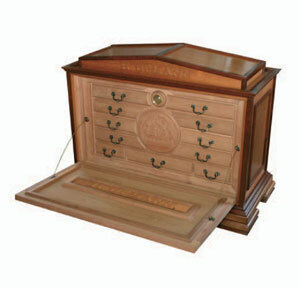 Each of the smaller humidors contains 3 drawers that are opened by a magnetic contact system. The central humidor, whose height and location dominate the piece expressing the exclusivity and forward thinking of the Cohiba brand and in particular its new COHIBA BEHIKE line is decorated with 1,882 silver pieces in the form of the new line’s chequered livery. It contains 5 drawers and a cupboard to store full boxes (capacity until 100 habanos), all fully humidified. There is a secret compartment hidden inside and astorage area for smokers’ ccessories. All the humidors have a humidification system which guarantees the optimum conditions for the conservation and storage of Habanos. For the first time, a Habanos humidor will have an opening system assisted by automatic, mechanical control, although each humidor can also be opened manually with separate, numbered keys. The drawers are opened by a digital touch system. The mechanical system is totally insulated against any noise by a coating of fiberglass (thermal acoustic insulation). The following materials have been used in developing the humidor. Cuban hardwoods: cedar, mahogany, ebony and phycis. Precious metals: silver, gold and others such as steel, bronze, pearl and semiprecious stones. Dimensions: 4 Towers: 42 x 30 x 30cm, central tower: 150 x 40 cm, base: 19 x 120cm height. Overall dimensions of the piece: 170cm height, width 120 cm. Depth 120 cm. This humidor contains 350 Habanos including the most emblematic of each of the different Cohiba lines: 25 BHK 56, 25 BHK 54, 25 BHK 52 (vitolas that make up the brand new Behike line launched at the XII Festival, but not yet on the market), 25 Genios, 25 Magicos, 25 Secretos, 25 Siglo II, 25 Siglo IV, 25 Esplendidos, 25 Robustos, 25 Lanceros. In addition, special cigars that were part of special productions, but are not on the market today, including: 10 Cohiba Gran Reserva (52 ring gauge by 150mm long), 25 Piramides (52 ring gauge by 156mm long), 20 Sublimes Extra (54 ring gauge x 184mm long), 20 Robustos Especial (50 ring gauge by x 192mm long). Jose Ernesto Aguilera Reina is a craftsman, designer and self-taught goldsmith. His talent and experience have been recognized and rewarded in different fairs and personal exhibitions in Cuba and abroad. He won the Grand Prix devoted to cigars in the Pure Art 2008 event and the FIART Crafts Prize 2009, and other major awards. Since 2005 his works have been present in all the Habanos Festival Auctions. His works decorate and grace different rooms, libraries, restaurants, galleries and walls in Havana and around the world. Important private collections in the USA, Italy, France, Russia, Germany, UK and other countries also treasure his works.